The Android OS has brought about a big revolution as to how Smart-phones are used. With the kind of hardware modern smart-phones come with, they can do a lot more then just being a camera, media player and a phone, they can be used as brains for little robots. Google first sent Google Nexus S at the edge of the atmosphere back in December 2010 via weather balloons. This past week Google posted a video showcasing how the Nexus S is being used by NASA to power its SPHERE satellites (Synchronized Position Hold, Engage, Reorient, Experimental Satellites). These Sphere Satellites are free floating devices that NASA says were actually inspired by the 'Light Saber' droid from the popular Star Wars series and were developed by MIT. SPHERE Satellite is a self contained system with power, propulsion, computing and navigation equipment. Now basically these Nexus S powered robots perform simple tasks the astronauts are used to doing, like recording sensor data and capturing video footage. This gives the astronauts more time to concenterate on their experiments by saving their time used in performing menial tasks. The SPHERE was originally designed for a different purpose and needed upgrades to become a remotely operated robot. The other thing being the team which originally developed the SPHERE at the time couldn't imagine all the possible potential applications, so they added expansion ports to accommodate additional sensors and peripherals such as, cameras and wireless power transfer systems. Nexus S was also a good fit because of its various sensors which include gyroscopes, accelerometers, proximity, light sensors and low-powered, but high performing processor. That's how the Nexus S smartphone could be easily attached to it. 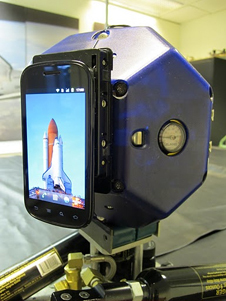 In-fact Nexus S is the first commercial smartphone certified by NASA to fly on the space shuttle and to be cleared for use on the space station. For the future the phones will control and maneuver the SPHERES using the IOIO board. The interesting part is that the the data logger used by NASA to record sensor reading is an Open Source application developed by Engineers at Google, being open source you can play around and work on the same data logging app that NASA is using.